Here you will find lots of useful information for your holiday in Praia da Rocha, in western Algarve, Portugal! See how to get to Praia da Rocha from Faro Airport by transfer, bus or taxi and how much it costs, print off useful telephone numbers to take with you on holiday and see where the tourist information office is. You can also check out the opening hours for the couple of small supermarkets in Praia da Rocha and the other main supermarkets in Portimão. Plan your journey from the Algarve's international airport in Faro with our Praia da Rocha travel information! Travel from Faro to Praia da Rocha by Train: The train goes from Faro to Portimão (6€ -regional train) then get a bus to Praia da Rocha (see below). Travel from Faro to Praia da Rocha by Bus: 5.50€. Travel from Faro to Praia da Rocha by Taxi: 72€ / 86€ for a 4 or 6 seater Mon-Fri 6am-9pm (93€ / 111€ outside this time and bank holidays). To get to Faro train or bus station (which are close to each other just before Faro marina) either get the bus from the airport (the stop is right outside the 'arrivals' doors) and will cost you around 1.95€, or get a taxi at a cost of around 10€. To check train timetables visit CP - Comboios de Portugal (the site is available in English) and select 'Regional and Inter Regional services' to get the timetable for Lagos/Vila Real de Santo António/Lagos. For bus timetables visit Eva Bus. Again most of it is available in English except the 'frequency' on the tables. (Days of the week: Monday is the 2nd day of the week - '2as'-and Friday is the 6th day. 'Sábado' and 'Domingo' - Saturday and Sunday; 'Feriados' is holidays; 'Diariamente' is daily,). Bus times from the 'aeroporto' to Faro are also listed . For additional bus timetables visit Frotazul Algarve which covers a limited area of the Algarve. *We quote Comboios de Portugal (regional) and Eva Transports pricing and prices of the standard taxi firms that work at Faro Airport. Please note that prices may vary. Book Algarve car hire to travel to Praia da Rocha! If you want to book Algarve car hire to travel to Praia da Rocha then it couldn't be easier! Simply collect your car from Faro Airport and drive down the A22 motorway (a toll road) or down the secondary N125 road to Portimão in western Algarve. Uncovered! 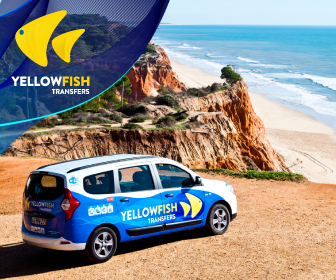 Get the best deal on your Algarve car rental & compare rates with leading suppliers such as Hertz, Avis, Budget, Europcar, Thrifty, Guerin and Goldcar! Portimão has a network of local buses that make it very easy to get around very cheaply...always a benefit! The network, currently consisting of 14 routes ('linhas') is called 'Vai e Vem' and the cost per journey is 1,50€ or you can buy a daily ticket for 3,50€. All the buses on the Vai e Vem network have ramps and areas for people with reduced mobility. Route 31 Largo do Dique - Hospital via Est. Alvor (Monday to Friday) stops include the train station and Fairs and Exhibitions Park. Route 32 Largo do Dique - Hospital (daily) stops include the train station, Largo Gil Eanes and the Fairs and Exhibitions Park. Route 33 Alameda - Fortaleza in Praia da Rocha (daily) stops include Portimonense football stadium, Largo do Dique, Museum and Hotels Jupiter and Oriental. Route 35 Praia do Vau - Ladeira do Vau (Monday to Friday) stops include Hotels Presidente, Luar, Jardins da Rocha, Largo do Dique and the Market. Route 3N - Nightime service from 1st July to 31st August from Largo do Dique to the Fortaleza (Praia da Rocha) stops include Hotels Jupiter and Oriental. 14 Largo do Dique - Alvor (marginal) stops include Portimonense, Auditorium, Praia do Vau, Prainha, Torre C, Hotel D.Joao ll, Dunas do Alvor, Sports Complex and river front. 1P Largo do Dique - Alvor centre. Stops include Patio da Rocha, Tres Castelos, Praia do Vau, Prainha, Hotel D.Joao ll, Dunas do Alvor, Sports Complex, Alvor river front. More information about timetables and tickets is available at Frota Azul in Largo do Dique, Portimão. Portimão doesn't have a bus station but the main stops are on the waterfront with Vai e Vem bus stops in Largo do Dique and other buses on Avenida Guanaré near the Repsol petrol station. Note: Just remember, if you are calling from a foreign mobile phone in the Algarve, Portugal, you will need to dial 00351 in front of the numbers here. The tourist train ('comboio turístico') is a great way to travel around a town and helps visitors to get a feel for an area, which can be really useful on arrival, as well as providing cheap travel throughout a holiday. The tourist train operates between 10.00 and 23.30 and leaves every half an hour. It starts from the "Miradoura" (view point) on the Avenida Tomás Cabreira, going to the Fortaleza, Marina and Praia do Vau. Tickets cost ~3,50€. Please note: Some tourist train organisations may reserve the right to cancel tours without prior notice, due to the maintenance of the vehicles, weather conditions or insufficient number of passengers. There are a couple of small supermarkets in Praia da Rocha for every day supplies but all the main supermarkets are in Portimão. Check out Portimão Shopping for more information! Question about Praia da Rocha?